What are the pros and cons of living in the Palmer region of Alaska? Palmer is a rural town north of Anchorage. You feel like you are in your own little part of the world there, but you are still close to the services of Wasilla, which is nice. So if you need stuff Palmer doesn't have, you are still within twenty minutes to all of that. But Palmer itself has small shops downtown, fast food, big box stores, grocery stores, and Fred Meyers. If you need to get to Anchorage, you are within an hour away with traffic free highway. The closest hospital is in Wasilla, but general practices are located in Palmer as well. Downtown Palmer retains a small town America feel, and the neighborhoods around it vary from suburban to rural, hidden, and set off the road. Palmer is also sort of the hub of agriculture in Alaska (It's not all that much), but you will see farms around the town and Mat-Su region. It is as close to nature as you can get, without leaving the security of civilization. Nature is all around too, great for exploring, hiking, fishing, whatever you want. I would not describe Palmer as Rural. Not rural, like Western Alaska or Southeast... But certainly not urban. But Palmer itself has small shops downtown, fast food, big box stores, grocery stores, and Fred Meyers. Actually no. No big box stores. In fact Palmer has fought tooth and nail to keep big box stores out. They do have a small Freddies that is groceries only and a Carrs (Safeway). Everything else is small and local. Wasilla's "big box stores" are limited to Home Depot, Lowes, Sportsman Warehouse, Walmart & Sears. Plus a full service Fred Meyer. Anchorage has almost all the big box stores. The closest hospital is in Wasilla, but general practices are located in Palmer as well. Hmm... I consider the hospital more in Palmer than Wasilla. And it's on Palmer City Water. If you measured from downtown to downtown, the hospital is about 1/2 way in between. Palmer is a great town. 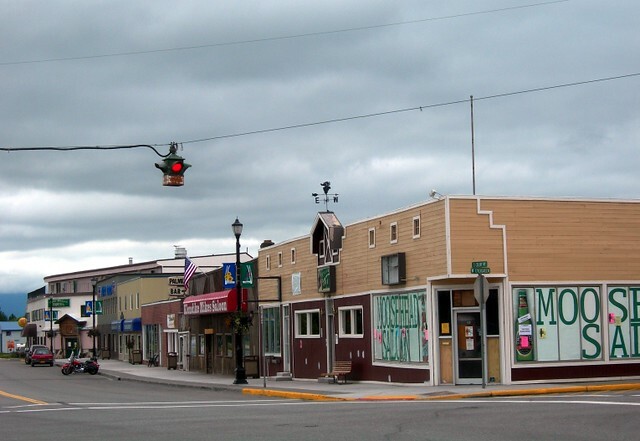 The pros are the small town feel, the close access to the wilds of Alaska with fairly easy access to modern civilization. The cons: depending on your skill set you may have to look in Anchorage for work and do the commute. And as the Valley has grown, traffic has gotten worse. Not horrible, but not fun at times. They are doing a bunch of road construction of the next few years that'll help though. Agreed that Palmer has its good points. Traffic- well, depends on when you go but the road back to Anchorage is 2 lane and I often encountered passive/aggressive drivers in left lane who wouldn't move right for faster vehicles so that is traffic. There is a large volume of commuting between the valley and Anchorage. It can't be overstated that the wind in Palmer can be exceptional, and it blows hardest in winter. I've been just as cold in the parking lot at the Palmer Fred's as I've ever been in the interior. Still though, all things considered, the outskirts of Palmer is probably where I would choose to live if I didn't like my job up here in Delta so darn much. I lived off of the Palmer Fishhook for a year or so. I really liked the area, but the town it'self is windy in winter. Also found it to be a bit cliquish, not that there is really anything wrong with that. Beautiful area though. I'd definitely consider it a positive experience and if I had to move back to S. Central AK, would probably look to Palmer as the place to live. Rural is an appropriate word to use when describing Palmer to someone from the lower 48. It fits the common definition of the word. More far-flung locations are better off being referred to as "remote." Not even close; School competes at AAAA level in sports, 30 miles from the largest population center in the state. Next door to Wasilla the population boom area. Nope not rural in any sense of the word.